Montefiore’s Immunologic Diseases Center of Westchester is the first and only center of its kind in the tristate area. As part of Montefiore Health System, the Immunologic Diseases Center will provide streamlined and coordinated care from specialists in the fields of allergy, gastroenterology, pulmonary medicine, rheumatology, dermatology and endocrinology. The Center will focus on the treatment of all diseases affecting the immune system, including rheumatoid arthritis, inflammatory bowel disease, autoimmune thyroiditis, food allergies, asthma and many others. The Center combines the expertise of our prominent, nationally recognized clinicians and uses a collaborative approach to diagnosing and treating immune diseases. By working together, our team provides comprehensive medical care that achieves significantly better patient outcomes. Most leaders in the field of autoimmunity believe that state-of-the-art, multidisciplinary centers for immunologic and autoimmune disorders are the best approach to treating immunologic diseases 1 2. We are proud that our unique center fulfills this vision. The Immunologic Diseases Center is located at 150 White Plains Road, Suite 200, Tarrytown, NY 10591. To schedule an appointment or to refer a patient, call 888-IMMUNE-3 (888-466-8633). At the Immunologic Diseases Center of Westchester, our team of board certified, experienced experts offer specialized care for adult patients with simple to complex allergic and immunologic disorders. We provide our patients with expert diagnosis and treatment of food allergies, eczema, chronic nasal congestion, chronic rhinosinusitis, nasal polyps and related conditions, with the goal of providing long-lasting solutions. Our specialists focus on understanding and identifying the causes of allergies and developing individualized treatment plans tailored to each patient. Patients have access to allergen elimination regimens to identify and minimize the effects of allergens. Patients also have access to clinical trials and innovative, research-based therapies that include the newest biological therapies for allergic disorders. Manish Ramesh, MBBS, PhD, Assistant Professor and Attending Physician in the Division of Allergy and Immunology at Einstein and Director of the Montefiore Food Allergy Centers in Scarsdale and the Bronx. Dr. Ramesh’s expertise includes primary prevention techniques to assist parents and caregivers in preventing young children and infants from developing food allergies, diagnostic techniques for patients with food allergies, and the treatment of food allergies through oral desensitization. Denisa E. Ferastraoaru, MD, Assistant Professor and Attending Physician in the Division of Allergy and Immunology at Einstein, Montefiore and Jacobi Medical Centers. Dr. Ferastraoaru also serves as the co-director of the Chronic Sinusitis Center at Montefiore. She specializes in the treatment of allergic rhinitis and chronic rhinosinusitis. Dr. Ferastraoaru offers revolutionary care through diagnostic challenges that can provide a more precise picture of a patient’s allergic condition in order to develop an effective treatment and management plan. Montefiore is recognized as one of the top hospitals in the region for gastroenterology and gastrointestinal (GI) surgery. Our distinguished, multidisciplinary team at the Immunologic Diseases Center of Westchester provides expert care in a wide spectrum of GI diseases, with a special focus on the treatment of inflammatory bowel disease (IBD), Crohn’s disease and ulcerative colitis. Our physicians have access to the most advanced technology, treatments and diagnostics in gastroenterological care. Thomas Ullman, MD, Professor of Medicine and Chief of the Division of Gastroenterology at Montefiore and Einstein. Dr. Ullman leads this practice and brings extensive experience in delivering expert IBD care in the greater New York area. An internationally renowned expert in IBD, Dr. Ullman has conducted extensive research on the relationship between IBD and colorectal cancer, and he has led national efforts to improve the quality of IBD care. He is also a local board member of the Crohn’s & Colitis Foundation of America. 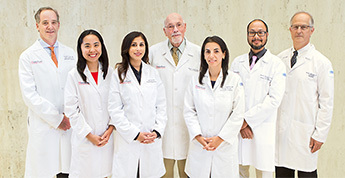 Through groundbreaking research and exceptional clinical expertise, our team of experts in the Division of Rheumatology at Montefiore and Einstein has developed new therapies and revolutionized the care of patients with complex and life-threatening rheumatologic diseases. Our patients receive diagnosis, treatment and high-quality care from experienced academic rheumatologists at the Immunologic Diseases Center of Westchester. As patients with rheumatologic conditions may experience additional immunologic issues, our team works closely with our colleagues in gastroenterology, allergy, and other specialties to assess and treat the patient’s full range of medical issues and to create individualized treatment plans. Patients also have access to new therapies, including biological therapies through our research and clinical trials. Ruchi Jain, MD, Assistant Professor and Attending Physician in the Division of Rheumatology at Montefiore and Einstein. Dr. Jain’s clinical expertise includes caring for patients with rheumatoid arthritis, spondyloarthritis (such as psoriatic arthritis and ankylosing spondylitis), lupus, vasculitis, osteoarthritis, gout and osteoporosis. Shudan Wang, MD, Assistant Professor and Attending Physician in the Division of Rheumatology at Montefiore and Einstein. Dr. Wang specializes in a broad spectrum of rheumatologic diseases, including but not limited to lupus, Sjögren’s syndrome, vasculitis, myositis, rheumatoid arthritis, psoriatic arthritis, osteoarthritis, crystal arthropathy and scleroderma. Montefiore’s Division of Pulmonary Medicine provides high-quality care for adults with a broad spectrum of respiratory conditions and diseases, including asthma, chronic obstructive pulmonary disease (COPD), sleep disorders, environmental and interstitial lung diseases, lung nodules and tumors, infections and rare diseases of the chest. With the goal of helping severe asthma patients to be healthy and symptom-free, our pulmonologists at the Montefiore Immunologic Diseases Center of Westchester work collaboratively with specialists in allergy medicine to administer tests, diagnose and treat asthma. Through these collaborations, patients are tested for occupational and nonallergic irritants as well as environmental triggers that may be exacerbating the patient’s condition. Studies show that 50 percent of patients are not using asthma medications correctly. To address this issue, we have an on-site educator who can instruct patients in the proper use of inhaled medications. Moreover, our physicians developed a revolutionary, new smartphone application (called ASTHMAXcel) that can help patients with asthma management. Patients with asthma treated at our Immunologic Diseases Center will have access to promising new therapies and opportunities to benefit from cutting-edge clinical trials. Simon D. Spivack, MD, MPH, a world-renowned pulmonologist, leads this practice. Dr. Spivack established Montefiore’s Asthma Center in 2011 to deliver comprehensive, consistent and targeted care for patients with the most complex cases of severe and refractory asthma. Our expert endocrinologists at the Montefiore Immunologic Diseases Center of Westchester provide comprehensive, cutting-edge treatment for patients with autoimmune thyroid diseases including Graves’ disease and Hashimoto’s thyroiditis. Graves’ disease is an autoimmune disorder of the thyroid gland in which the immune system produces antibodies that stimulate the thyroid, causing hyperthyroidism (an overactive thyroid gland). Treatment for Graves’ disease can range from medication to radioactive iodine therapy to the surgical removal of the thyroid gland. Hashimoto’s thyroiditis is an immune disorder in which the body’s immune system is dysregulated and recognizes the thyroid gland as foreign. As a result, immune cells and antibodies attack the thyroid gland, destroying thyroid cells. The resulting inflammation impairs the thyroid gland’s ability to supply sufficient hormones and leads to hypothyroidism (an underactive thyroid gland). Like many other autoimmune diseases, Hashimoto’s thyroiditis affects women much more frequently than men. We offer on-site testing to confirm or provide a diagnosis, and we work with patients to develop a comprehensive plan for treatment and management. When other experts are needed, our multidisciplinary team works in coordination with other subspecialties—such as rheumatology, cardiology and dermatology—all together on-site at the center. Martin I. Surks, MD, MACP, Professor of Medicine and Pathology, Division of Endocrinology, Montefiore and Albert Einstein College of Medicine, is a thyroid disease expert with 40 years of experience in basic and clinical research, education and patient care. Dr. Surks is the former president of the American Thyroid Association and a member of the American Society for Clinical Investigation and the Association of American Physicians. He was awarded a Mastership by the American College of Physicians in recognition of his contributions to research, education and teaching.